John Drew Barrymore and Ettore Manni star in this very unusual horror themed Peplum. Blackhorse UK R2 DVD. A rebellion is rising in a remote corner of the Roman Empire and a group of rebels steal some valuable treasures from the Roman forces. The senate in Rome selects the centurion Gaius (Ettore Manni) to investigate. 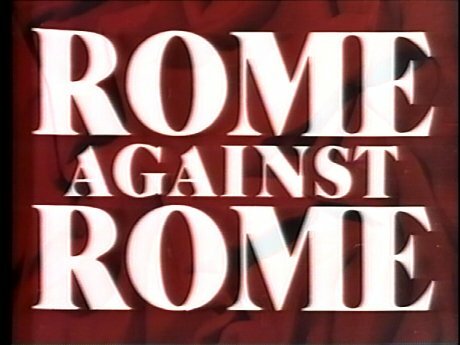 He finds that the Roman appointed governor is crooked and in alliance with the mysterious cult leader Aderbad (John Drew Barrymore) who is working on a sinister project to raise dead Roman soldiers to form an army. Roma contro Roma certainly bosts a very original concept, but not much more. What storyline there is seems to be loosely draped over the concept to try and stretch the film out to feature length, but even this doesn't work very well, leaving the film slowly paced and unexciting with little more than a cliché and uninvolving romance and no characterisation at all - a few generic twists and turns in the middle of the film will come as no surprise to genre fans and none of the ideas are built up enough to make you care. Even the key idea of the zombie Roman soldiers that is the very raison d'etre of the production seems poorly developed and by the end the script seems unable to decide if they are corporeal or fantasms. Behind the camera, Giuseppe Vari does some good work, building up some effective atmosphere with a couple of beautiful Bava-esque set pieces in the temple of the cult. Unfortunately the budget is not up to the script and the battle scenes are entirely comprised of culled stock footage - the climactic zombie battle is achieved by simply adding a thick grey haze over footage nicked from Hannibal (1960) making this oft-reused footage completely incomprehensible. The undead rising is accompanied by an effectively dark score while the rest of the film has an adequate if uninspired soundtrack from Roberto Nicolosi (La maschera del demonio (1960)). Acting is one sector where the film does at least manage to hold its own, if only for the leads. Italian actor Ettore Manni appeared in a number of Pepla but was never able to receive the same level of recognition as his American colleagues found in the genre, but he impresses here as the heroic lead, although he doesn't have much chance to do anything with his character, nor does the beautiful Ida Galli who looks good as his love interest. American actor John Drew Barrymore lived in Europe for several years in the early 1960s while trying to rebuild his career, making a number of historical adventures - as the cult leader here, he is playing the part he seems born to have played and is simply superb in the role. The rest of the cast are quite forgettable. An eye catching idea is wasted on a script that cannot even make sense of its key theme properly, let alone the romantic and political subplots which provide the foundations for most Pepla, but here just seem to be randomly thrown in and do nothing to aide the pacing. The production is similarly not up to the job of realising whatever vision the film has and resorts to using mangled stock footage. Only the three leading performers are enough to make the film watchable but the end result is certainly not recommended. Of the entire Euro-cult canon, this is one film screaming out for a big budget remake. Who is it for? A curio, of interest to Peplum fans and probably not the genre's worst entry, but far from recommendable. Ercole al centro della terra (1961) Two other horror themed genre entries that follow the more Traditional Peplum route (ie. muscled strong-man) rather than attempting to be historical epics and are far more effective as a result. Maciste contro il vampiro even includes a horde of zombie soldiers. Print is clearly sourced from a VHS and is of average quality, quite low resolution and the night scenes are very dark. Some cropping evident. Some noticable hiss in the background throughout but the dialogue and music are clear. Other regions? Similar US release from Jef films. Cuts? Cut status unknown - the original submission to the BBFC runs approximately six minutes longer (after PAL speed-up is taken into consideration) but there are no obvious cuts - AIP (whose credit is at the start of the print) routinely re-edited and even rescored Pepla. The print used is English language although the title card seems to be from a different source. With neither the quality of script or the budget to match its interesting concept, this is a weak film and not recommended. A poor looking DVD, although of quite good quality in the field of PD Pepla - the film does not particularly warrant a better release. See our reviews of more films staring John Drew Barrymore and more Peplum DVDs. All text in this review written by Timothy Young - 22nd March 2010.